To many coffeeholics, having a hot cup of freshly brewed coffee in the morning is one way to start the day on the right track. While studies show that it is healthy to do that as long as you are not smoking, have you thought about the toxins getting into your coffee? The recent brewers are coming with plastic parts which bring in the question, are coffee makers BPA free? That is something the cautious buyers will seek answers to before selecting the final product. If you thought your coffee is all clean, it’s time to think again. Your chosen brewing method could be a lifesaver or a death trap as time progresses. 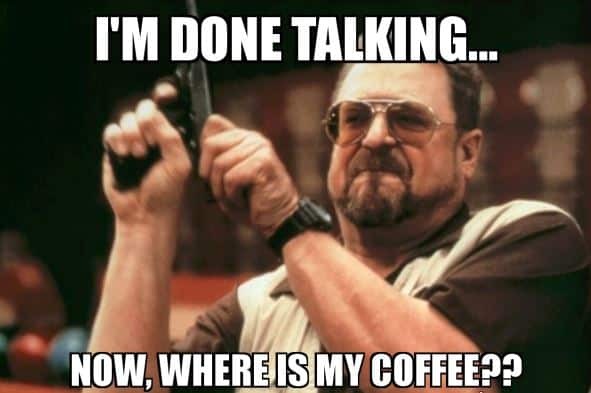 That is why you need to read through and know how to select a BPA free coffee maker before I introduce you to some of the best recommendations. 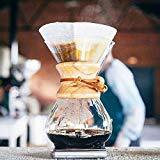 For those who cannot wait to see the coffee maker recommendations, here is my personal list of some of the guaranteed BPA-free brewers. Modern design suitable for modern kitchens. BPA free and SCAA certified. Stainless steel carafe holds 48 ounces. Comes as a pour over and drip machine. Cleaning the top part of the craft is quite difficult. It takes more time to brew. 3-layered filter delivers grounds-free coffee. Comes with a bonus filter screen. Bound to rust. Perfect for achieving a rich brew. Quality filters. Takes more time to brew. You may have heard fellow customer complaining about a recent coffee maker they just purchased. If you have not heard such a statement, then you might be one of the victims. Whether you have been through such a horrid experience or not, plastic taste is something you don’t want in your coffee. More bits of information are coming up on how various synthetic forms shed chemicals when they come into contact with hot liquids. One of the compounds that I’m addressing is the BPA (Bisphenol A) which has some serious health concerns. It would be best if you had a hot cup of coffee and that’s where all the trouble starts. If you have a plastic container with the BPA compound, putting hot water in it makes the chemicals leach into the water. Research from the FDA shows that BPA leaches into hot food and beverages 55 times faster than in cold encounters. We need hot water to brew coffee. That is why such results need addressing. You can research on the internet about BPA effects but to make it simple, here is a summary for you. It is found in epoxy resins, and polycarbonate plastics used to store food among other plasticized products. Once BPA enters your body, it has the potential of playing the role of natural hormones which can affect the physiological changes in your body. If exposed to coffee, BPA can damage your brain, increase the amount of fat formation in your body, and maybe even alter how your immune functions. The few mentioned effects are enough for you to check if your coffee maker is safe to use. Now, if you were getting rid of your brewer due to lousy plastic taste, what you didn’t know is that you were maybe excluding a unit that could have compromised your health. Now that you know what BPA can do to you, let’s get into the main business – choosing a BPA free coffee maker. 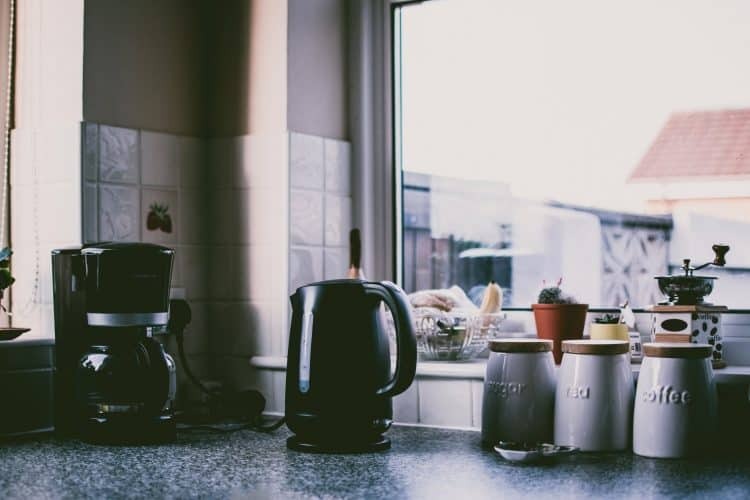 Nowadays, single serves and drip coffee machines are found in more homes than before. The advantage here is that they are convenient, but the plastic part brings in the BPA fear. Where do we go now? Many options are claiming to be glass and stainless steel, and that’s some light at the end of the tunnel. If you are still worried about what’s in your cup of Joe, this is where you need to look into. Arriving at a safe choice means going for a coffee maker that has no plastics as you make sure nothing, from ground coffee to hot water gets into contact with plastic. Yes, they are available as we will see in the review section. 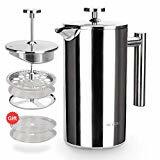 As you ponder on the considerations, how about going back to the old coffee percolator in the attic, using a French press, pour-overs or drip makers certified as BPA free? As a member of the coffee society, it is essential to check if the unit is BPA free and we have tips aligned for you in the last section. That especially goes to plastic coffee machines that boast of having no BPA as the hardening material. You see, the issue here is that BPA materials are still in circulation hence the need for some education. Can You Wait For A Cup Of Coffee? Now that you don’t want any plastics near your coffee, do you think you have the time to wait as you use the pour over or a French Press? You need more time when using the pour over than the unit requiring the press of a button. The benefits of shifting your coffee making ritual from the programmed units to something that needs your hands are beyond a BPA-free zone. Those who have been taking coffee longer than I say that it is always better when prepared manually over button pressing. Getting a plastic-free coffee maker is one way to make sure that you are addressing the concern if you are not sure about the plastic units with BPA free certification. Here are some products for you to consider. They include a glass brewer, a stainless steel French Press option and a BPA free unit. One of the units that qualify as BPA free is the OXO Barista 9 Cup Coffee Maker which is also SCAA-certified. Buying this unit means getting a pour over brewer and a drip machine that makes up to 9 cups of coffee. When I say that it is SCAA certified, it implies that the coffee maker has gone through some rigorous testing before counting it as one of the better ones. At the top of the coffee machine is a clear container that people question whether it’s plastic or not. OXO Barista verifies that is glass-made and for those who are still in doubt, the unit would not be certified as BPA free if it was plastic full of the hardening component. 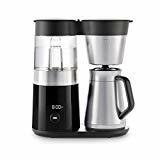 The coffee maker comes with a 48-ounce carafe that has double-wall stainless steel construction and a programmed brew cycle that imitates the manual pour overs. You get between 2-9 cups of perfectly brewed coffee, but of course, that depends on the grounds or pods you are using. After heating the water, it stays at the right brewing temperature, between 197.6 and 204.8 degrees F. The temperature however varies depending on the amount of water in the reservoir. It takes more time to brew a cup of coffee since the shower head has to pass some water over the grounds before the extraction. That is why the carafe has to hold until it’s the right time to serve. The length of brewing is monitored as the internal mixing tube blends coffee to the desired taste. After brewing, your coffee will stay warm for the next two hours before an auto-shut off. To guide you through the brewing process, this machine has an LED display with a control dial that let you decide the waking time and the number of cups you need before the actual brewing starts. Next on the BPA free list is Secura French Press that guarantees durability by just looking at it. The material featured here is 18/10 stainless steel that functions as a double wall. That is what makes it a long lasting coffee. In case you are asking, there is no plastic contact in this coffee maker. The double wall construction makes it more efficient to keep hot coffee. It is always advisable to take your coffee as soon as you brew it, but if you need it later, this unit will retain the temperature for a longer time. What you use inside is what determines the quality of coffee you are brewing. You get three layers of stainless steel filter construction to help you trap the small coffee grounds. With a French Press, it is advisable to use coarse grounds since finer ones will clog the filters. When you choose this option, it also comes with a bonus screen which is also stainless steel. If you are looking for a more luxurious and refined taste, using more screens will get you there. Cleaning them is easy since you can remove the screen easily and all parts are dishwasher safe. 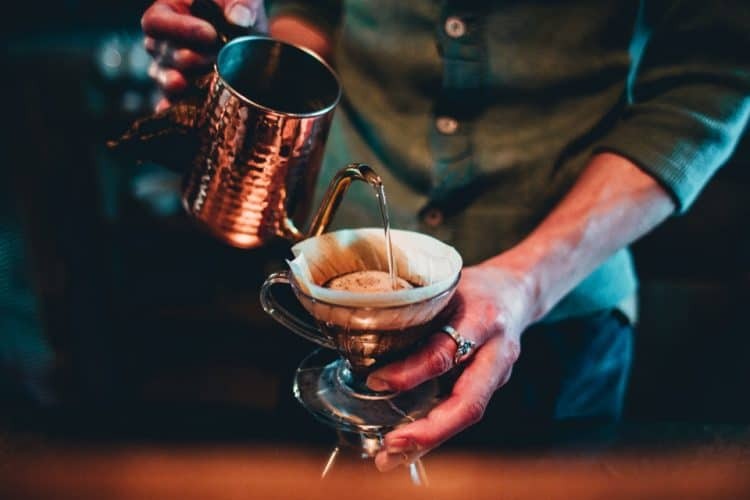 Brewing gives you a maximum of one liter (1000ml or 34 ounces) and you can serve without worrying since the knob at the top and handle is cool to hold. The last one on the review list is a coffee maker that takes you way back, but you will love how it brews if you are a coffee connoisseur. Since there are no plastics on the Chemex Classic Pour-Over Coffeemaker, you don’t have to worry about any BPA effects. The material consists of non-porous Borosilicate glass so, there are no odors left after brewing. 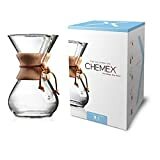 There are different models from Chemex where the older ones have thicker glass than the classic model. The neck position has a wooden collar with a leather strap around it. Filtering the coffee makes use of a thick paper, folded at the top in a cone shape before placing it at the top of the opening part. All you have to do is pour your ground coffee into the filter hole, pour a little hot water to wet the coffee, wait for 30 seconds then continue to pour the water in a circular motion until you reach the desired amount. One tip though, one tablespoon should brew 5oz. Also, you have to pour several times if you want a richer brew. 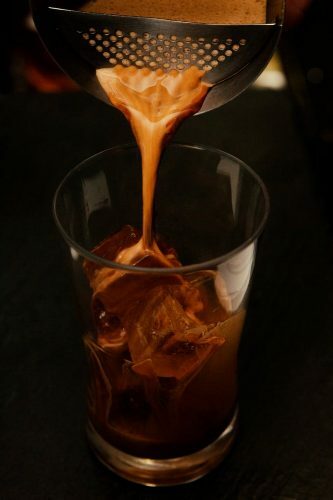 If you intend to keep the coffee for later, you can refrigerate the coffee or pour it in a separate jar before putting it in the fridge. On cleaning, the manufacturer advises you to remove the wooden collar then use soap and water to clean out the residue. If you don’t want to clean it every other day you use it, you can rinse it then wash it once in a week to remove the weekly residue. The plastic is too hard: If you see a clear and hard plastic, it is possible that it’s made of polycarbonate. If the manufacturer does not say that it’s BPA free, then it is a good idea to avoid it altogether. Plastic number 7 indicator: Look at the plastics labeling at the bottom of your coffee maker. If the base has a number 7 or ‘PC’ letters, then that’s a polycarbonate. However, you need to know that not all plastics with this number contain BPA. At times, it is used to refer to plastics in a different category. It is advisable to check for more information about the product to see what the number means on the specific product.